Celtic Dragons shooter Kalifa McCollin. 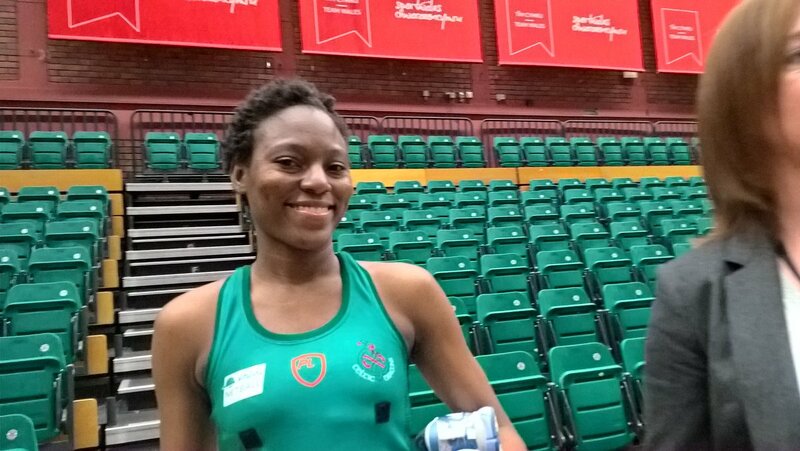 Khalifa McCollin, Celtic Dragons’ shooting star from Trinidad and Tobago, plays against her former team Saracens Mavericks in Cardiff this evening (Monday, 7pm). McCollin returned to Dragons this season and produced a 100 per cent shooting average during their 67-40 win against London Pulse at the Copper Box Arena. Captain Nia Jones and her team were bitterly disappointed to lose 57-40 at Severn Stars in Gloucester, but go into Monday’s opening home fixture of the season with massive determination. McCollin is delighted to be back in South Wales and says: “I’m loving it. “It’s quite different to what it was before with so many new players from different countries and backgrounds. It’s exciting. Dragons have brought in players from Jamaica, Fiji, Australia plus England and coach Tania Hoffman has ensured they have blended with the outstanding Welsh talent in their squad. The Welsh team had 11 interceptions at Severn Stars, but failed to make the most of their chances and McCollin says: “We weren’t connected at all through game. “Stars were aggressive and we shied away from that. We must and will make adjustments against Mavericks. “We have studied match footage and the girls weren’t happy with our team performance. Prior to that we had an outstanding performance against London. We know what we are capable of. McCollin is focused on producing her best form against Mavericks, saying: “I don’t get too nervous before matches. I know what Mavericks are capable of and definitely know what Dragons are capable of. “Our job is to get out there and do what we have to do. “We will be pushing each other, demanding from each other. “Mavericks will be sharp, quick and bring flair, particularly with Sasha Corbin and Kadeen Corbin. They will be quite physical and their game is similar to what we have to offer. Captain Nia Jones leads Celtic Dragons players on to court. Saracens Mavericks are third in the Superleague table after their 64-51 home win against Loughborough Lightning. George Fisher and Kadeen Corbin combining well in the circle, while the experience of Sasha Corbin shone through as she led the charge on turnover and combined well with sister Kadeen. This evening Mavericks will play in front of a sell-out Green Army attendance at the Sport Wales National Centre, Sophia Gardens and they will be backing Celtic Dragons all the way. The Team Bath Netball Superleague match against Severn Stars (Friday) postponed due to bad weather. Team Bath v Severn Stars, postponed; Surrey Storm 47, Wasps 70; Loughborough Lightning 60, Strathclyde Sirens 49. To be played Monday, February 4: Celtic Dragons v Saracens Mavericks (7pm); Manchester Thunder v London Pulse (live on Sky Sports television).